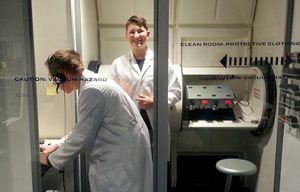 Sophomores Jeff Wood of Schoharie and Sean Collingbourne of Averill Park work in a lab area at the Challenger Learning Center. The 10th grade chemistry class did field work at the Challenger Learning Center of miSci, a simulated space station. The trip was part of the chemistry class’s Earth Odyssey project. Sophomore Caiden Larsen of Berne-Knox Westerlo said he was able to apply knowledge gained from the hands-on experiments to his class project.